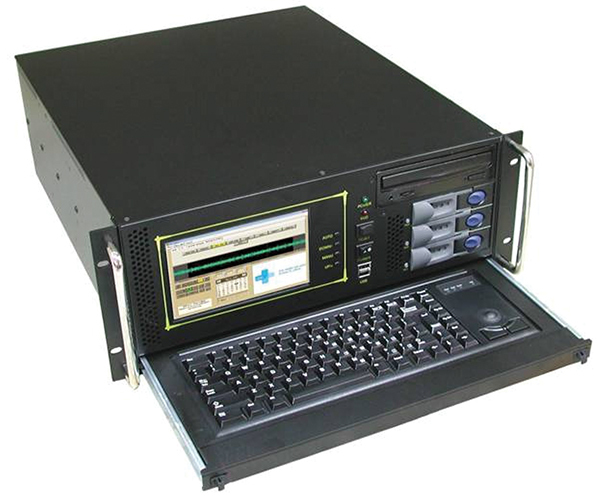 Flashlog 8 is a configurable, ultra powerful multi-channel logger which uses the Auricon and Digitorc sound cards, IP based line inputs (Axia or Wheatstone), radio capture cards and internet radio streams, in a rugged, reliable 4U chassis to continuously log up to 2 years of radio broadcasts or audio. Using the PC-DAB1-4 DAB+ multi-ensemble PCIe Radcap card, this latest hard disc logger records the entire contents of up to four ensembles. Decoding occurs during playback, showing DLS text, MOT slide shows and electronic programme guides along with the audio. But DAB+ isn’t all you get with Flashlog 8. Taking advantage of today’s powerful multi-core processors and growing hard disc capacities, Flashlog 8 pushes back the barriers on traditional line and radio capture logging with the ability to record up to 64 stereo line channels, 32 stereo FM stations, 32 AM stations, 4 DAB+ ensembles and 32 internet radio streams, limited only by the number of PCIe slots on the motherboard. The number of logging days can be independently set for each line, AM or FM channel, and for each DAB+ ensemble. All text fields are Unicode-based, allowing multilingual display and entry. Playback on both the logger and through Flashback 8 supports saving log extracts as MP3 (not available in the USA until 2018) as well as WAV, WMA and AVI files. Analogue, AES-3, Axia Livewire and Wheatstone Wheatnet-IP line inputs. Up to 64 stereo inputs, each reconfigurable as a pair of mono inputs. Up to four assignable line sub-categories for grouping channels. Selectable audio compression rates ranging from 80kbps to lossless compression. Adjustable number of logging days on each input. Balanced inputs and outputs with XLR breakout cables supplied. Live input monitoring on logger unit. Up to 32 AM stations and 32 FM stations. Adjustable number of logging days on each station. All FM logging in stereo. Received signal strength, FM stereo pilot and RDS indicators. Live monitoring on logger unit. Selectable carrier & audio failure alarms. Up to four DAB+ ensembles. Adjustable number of logging days on each ensemble. Entire MSC (main service channel) contents recorded. Receiver spectrum display, signal strength and quality indicators, and uncorrected error counter. Decodes legacy MP2 as well as HE-AAC v2 audio compression. Displays DLS text, MOT slides and electronic programme guide. Live monitoring of audio and data. Selectable ensemble, stream and audio failure alarms. Up to 32 internet radio streams. Shoutcast, Icecast and RTMP protocols. MP3 and HE-AAC audio encoding. Industrial 4U rack mount case. Optional inbuilt colour LCD screen with slide-out keyboard and mouse pad. Dual redundant hot-swappable power supplies. Hardware RAID-1 or RAID-5 swappable SATA hard discs with optional hot-standby disc. Inbuilt DVD R/W drive for easy archiving. Recording time of up to two years, settable on each channel or ensemble (subject to available disc space and dependent on the number of channels and audio compression rate used). 64-bit Windows 7 Professional operating system (Windows 8.1 is available as an option). Network playback using free Flashback 8 application (also compatible with Flashlog 5, 6 and 7 recorders). SNMP monitoring and alarms, including RDS / DLS text. The Flashlog 8 recorder runs as a Windows service and is controlled from under the Sources tab in the Flashlog application. Each line source can be configured as Stereo, 2 x Mono, 1 x Mono or Hidden. When set to Hidden, the source doesn’t appear on the playback screen but the input is still being recorded. The number of recording days is set from a drop-down list which is dynamically populated to ensure the hard drive space won’t be exceeded. If line channel subcategories have been created, the subcategory can also be selected from a dropdown list. A 12-character name can be assigned to each input, which is what appears on the playback button for that channel, and when 2 x Mono mode is selected, separate names are given to each channel. The audio compression rate can be set to 80kbps, 128kbps, 256kbps or lossless, and audio failure alarms can optionally be enabled. AM and FM radio capture sources are shown next, with edit fields for the frequency and an optional descriptive name. If RDS is present and no descriptive name has been entered, the transmitted station name is used and is dynamically updated should it be changed by the station. RF and audio signal levels are shown, along with stereo and RDS indicator lights for FM channels. Alarms (audio or carrier fail) can be optionally enabled. A drop-down list allows the number of logging days to be set, with the range determined dynamically from the available drive space. Flashlog 8 AM & FM Radio Capture Source Page. Next shown are the DAB inputs. Each ensemble has a spectrum display, an RF level indicator, a phase reference correlator level, an uncorrected error count and an alarm enable checkbox. When alarms are enabled, the Configure button opens a dialog box allowing alarms to be enabled or disabled on individual services. The number of logging days for each ensemble is set from a drop-down list. Flashlog 8 DAB Inputs Page. Finally shown are the internet radio streams displaying the URL, stream status, bit-rate, audio coding and audio levels, with drop-down lists for setting logging days and alarm enable checkboxes. Audio level meters, based on analysing the compressed audio data, are also presented. Additional buttons at the bottom of the Sources window provide further source and SNMP configuration. Flashlog 8 Internet Radio Streams Page. 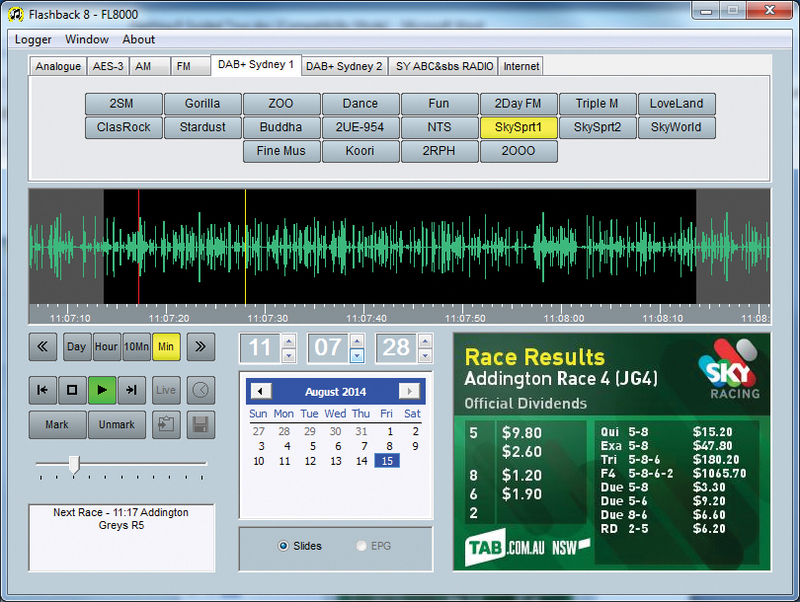 The playback screen, available under the Player tab on the Flashlog unit and in the free Flashback network playback application, provides easy selection of audio source and playback date and time. Across the top, tabs for each source category or subcategory select a group of up to 32 buttons, identified by the channel name. In the case of DAB sources, the broadcast short service name is used. The waveform display can span one minute, ten minutes, an hour or a day, as selected by the span buttons on the left. The date is selected from a calendar control, with the time set either by using the up and down buttons or by directly typing into the hours, minutes and seconds fields. The playback position can also be adjusted by dragging on the ruler bar below the waveform. A section of audio can be marked either with the mouse in the waveform window or by navigating to the start and end points and clicking on the Mark button. Once highlighted, the section can be saved to the Windows clipboard or to a file in WAV, WMA or MP3 format. For DAB channels, an AVI video file incorporating the slideshow and DLS text along with the audio can also be created. 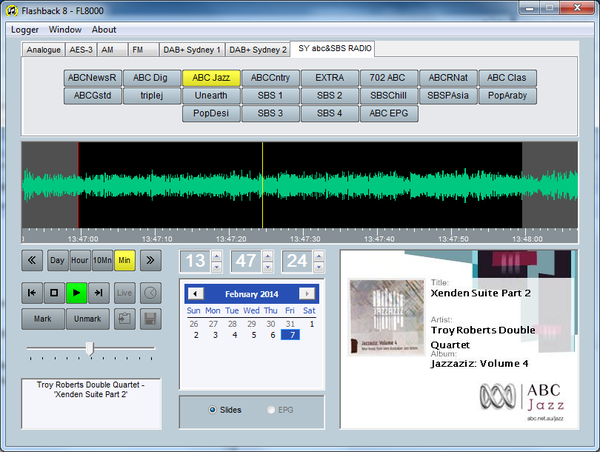 The display window on the lower left shows DLS text for DAB services, RDS radiotext for FM stations and artist/title metadata for internet streams. The window on the lower right shows skimming events for line channels, slideshows for DAB audio services, a program guide tree view for DAB EPG services and header information for internet streams. Flashback can be simultaneously used on multiple workstations, up to the limit imposed by the recorder’s operating system (20 users for Windows 7/8 or the number of installed CALs for server versions). 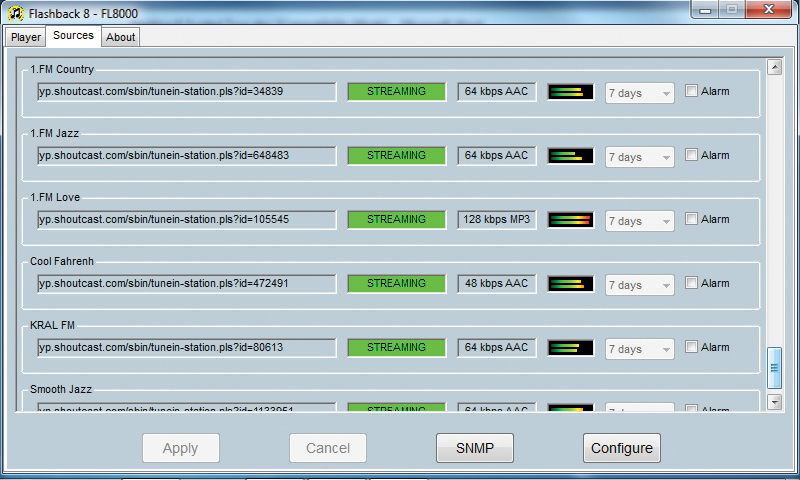 Internet stream capture of up to 32 internet radio streams, supporting Shoutcast, Icecast and RTMP protocols, MP3 and HE-AAC audio encoding and metadata recording. Capture of up to sixteen stereo inputs and playback outputs for Axia Livewire® and Wheatstone WheatNet®. 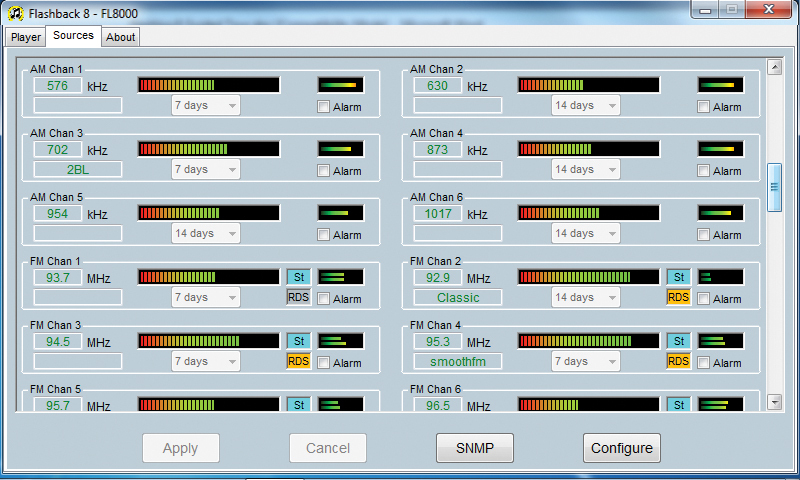 Ability to increase or decrease the number of logging days on each line, AM, FM channel or DAB ensemble. 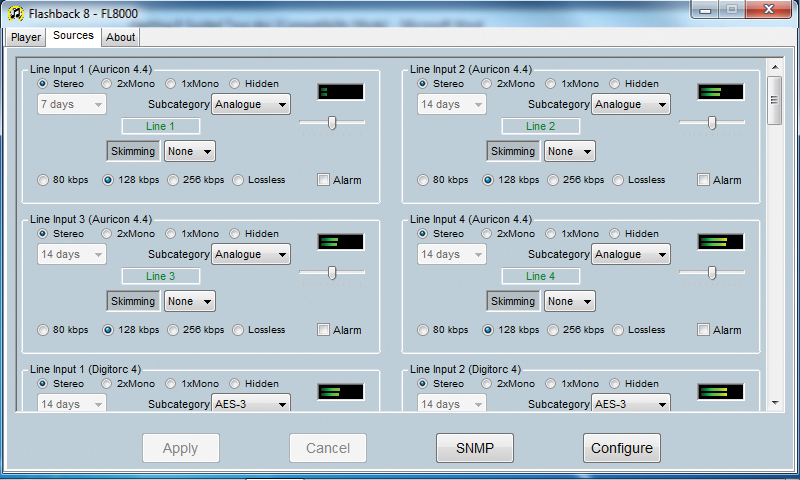 Ability to create line channel sub-categories, allowing a total of up to 64 stereo line channels. MP3 option when saving audio segments (not yet available to USA customers). SNMP and FM RDS decoding supplied as standard. SNMP reporting of RDS RadioText and DAB DLS text, as well as DAB MOT and DLS status. Full Unicode support for international use. Dynamic calendar control shows the range of recorded days. Jump-to-earliest and jump-to-latest buttons on player. Logging of AXIA GPIO events. Support for the new PCIe multi-ensemble DAB+ Radcap card. Axia Livewire: Optional software driver supporting up to sixteen stereo inputs and playback output. Wheatstone WheatNet: Optional software driver supporting up to sixteen stereo inputs and playback output. Skimming Option: 16 optically-isolated user-	assignable inputs. Daily event list display linked to audio log. Sequential playing and archiving of multiple events. FM Capture: 87.5 – 108.5MHz tuning range (50kHz steps). BNC antenna connection. 48kHz sampling. 64kbps compression. Maximum 32 stations. RDS radiotext logging. DAB+ Capture: Band III (174 – 240MHz) DAB Mode 1. BNC antenna connection. Maximum 4 ensembles. Maximum 32 services per ensemble. Dynamic reconfiguration. DAB+ and Legacy DAB supported.Decoding for MP2 /HE-AAC v2 audio, DLS, JPEG / PNG images, EPG. 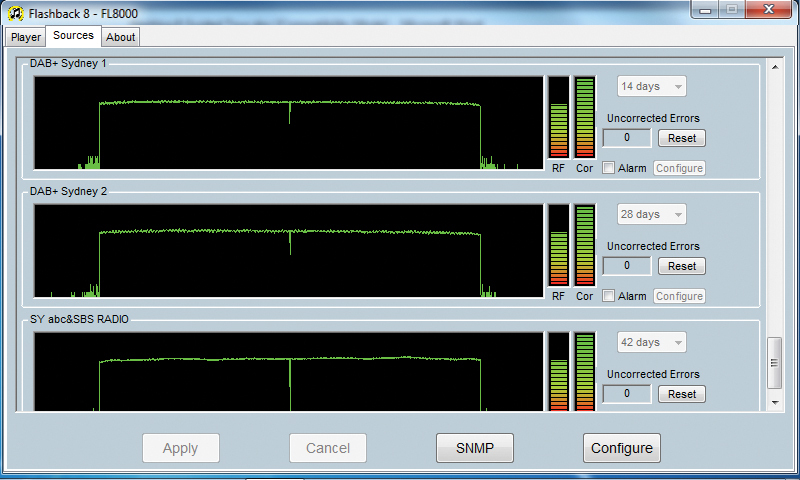 SNMP: Input audio / carrier / DAB status/RDS-DLS text monitoring. Selectable trap generation. Storage: Up to 3 x 4TB SATA hard discs with optional hot-standby disc. Hardware RAID-5 (striping) or RAID-1 (mirroring). DVD R/W drive (+/- formats supported). Processor: 64-bit Pentium quad-core 8GB RAM. Axia Audio® & Livewire® are trademarks of TLS Corporation. WheatNet® & WheatNet-IP® are registered trademarks of Wheatstone Corporation.